Did Iran shut down Adelson hackers for online gambling ties? An Iranian hacker forum was reportedly shut down by the government after forum members were linked to online gambling operations. Iran’s women’s national football team have caused a bit of a stir after it was revealed that eight of them were men. Did Iran’s supreme leader have a hand in writing the UIGEA? 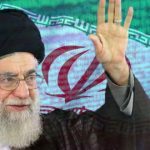 Iran's supreme leader Ayatollah Khamenei issues an edict on music that is as contradictory in its wording as the UIGEA was about gambling.